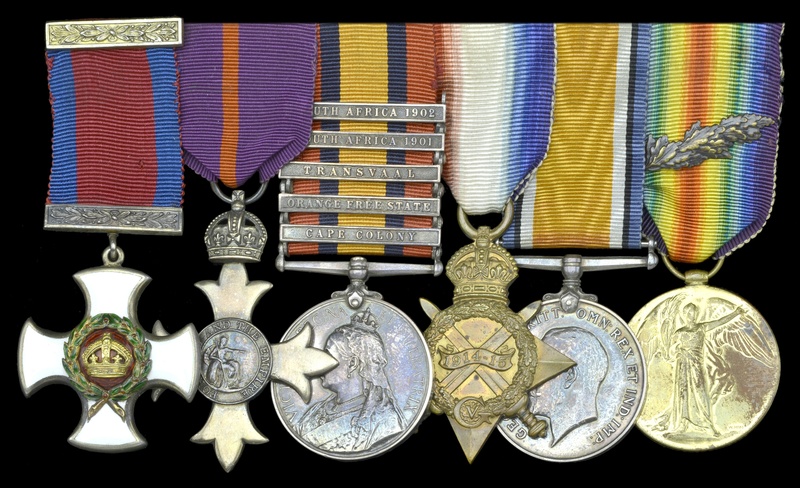 Trio : QUEENS SOUTH AFRICA MEDAL, BRITISH WAR MEDAL AND VICTORY MEDAL. 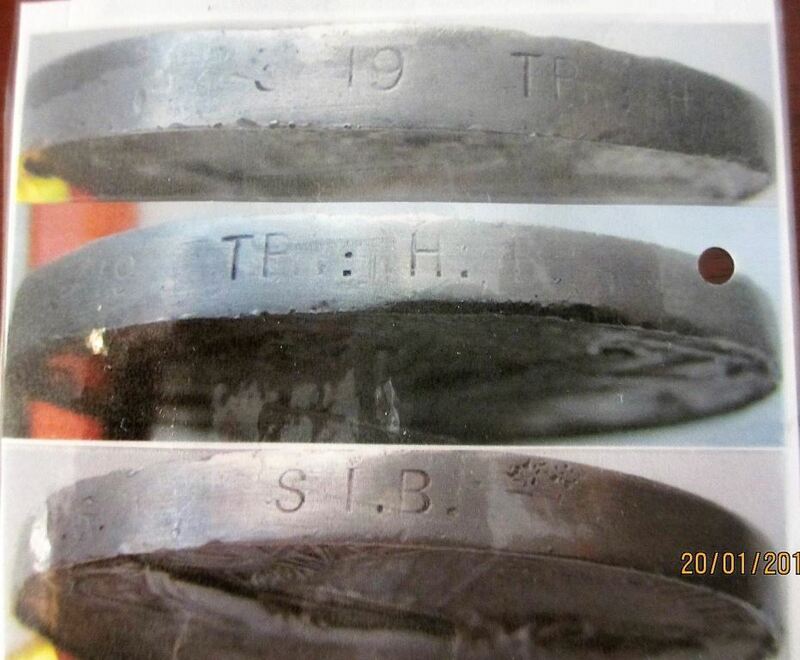 QSA with three clasps "CC, OFS, T" impressed 1153 SHG: STH: E. J. BISHOP VICTORIAN M.R. BWM and Victory Medal impressed 3303 A-SGT. E. J. BISHOP 5 PNR BN AIF. Edward John Bishop’s Boer war service was with the 5th Victorian Mounted Rifles as the Farrier Corporal and all three clasps are confirmed on the roll. Gassed but as it was caused by mishap it is not classed as a wounding (14th May 1918) “Platoon marched into to Corbie 13.5.18 which had been gas-shelled. Billets cleared and gas proofed and men warned against gas. L/Cpl Bishop with others visited areas other than billet area, which has been badly gassed. Evacuated following day sore eyes” No disciplinary action was taken. A great letter in Sergeant Bishop’s records by his wife describes his service “my husband said they were turned out of the hospital before they were well enough to make room for other cases and had to do two days march about 26 miles & had only been out of bed a few days. This sort of treatment to our men, to me, lwei’s what we would only expect from the enemy. Many of the bushmen were involved with the defence of Elands River, where Trooper McCausland is during this period is unknown. Worthy of further research. Andrew Frew, a labourer from Mosgiel, Otago, who was born in December 1880, attested for the 9th N.Z. Contingent and was embarked in the S.S. Kent in March 1902. A member of ‘A’ Squadron, he served in the Transvaal and was discharged at Wellington in August 1901; he was sent his Medal & 2 clasps in 1904. In October 1916, Frew attested for the New Zealand Expeditionary Force, direct from employment as a farm hand at Temuka. Drafted to the 1st Battalion, Canterbury Regiment and embarked for France in May 1917, he appears to have been admitted to a Field Ambulance on account of suffering from the effects of an enemy gas attack in August of the same year. Nonetheless, he rejoined his unit in the Field a few days later and died of multiple wounds on 13 December 1917; sold with copied research. Hugh Callaghan, a farm labourer from Ardgowan, North Otago, attested for the 9th N.Z. Contingent and was embarked in the S.S. Kent in March 1901. A member of ‘B’ Squadron, he served in the Transvaal and was discharged in October 1902. Callaghan died in December 1962 and his ashes were scattered in Anderson’s Bay Cemetery; sold with copied research and roll confirmation - he was sent his Medal & 2 clasps in 1904. William Thomas Turley, a barber from Greymouth, Westland, attested for the 9th N.Z. Contingent and was embarked in the S.S. Kent in March 1902. A member of ‘B’ Squadron, he served in the Transvaal and was discharged at Wellington in August 1902. Turley died in September 1928 and is buried in Wakapuaka Cemetery; sold with copied research and roll confirmation - he was sent his Medal & 2 clasps in 1904. Single: Queen's South Africa 1899-1902, three clasps "CC, OFS, T" impressed 253 Pte. J. HENDERSON, Queensland I. B. Note: 5th Queensland Imperial Bushmen roll shows his Christian name as “Henry” Henderson despite medal being named to a “J” Henderson. Walter Rogers, a farm hand from Sumner, Christchurch, attested for the 9th N.Z. Contingent and was embarked in the S.S. Kent in March 1902. A member of ‘C’ Squadron, he served in the Transvaal and was discharged in August 1902. Rogers died in May 1947 and is buried in Waikumete Cemetery; sold with copied research and roll confirmation. James Stewart Jordan, a telegraphist from Stratford, Taranaki, attested for the 9th N.Z. Contingent and was embarked in the S.S. Devon in March 1902. 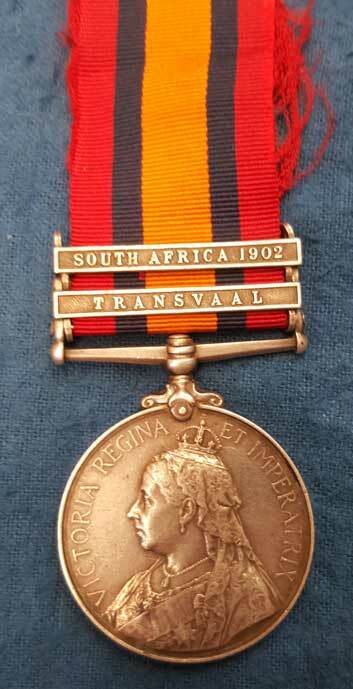 A member of ‘G’ Squadron, he served in the Transvaal and was discharged at Wellington in August 1902; sold with copied research and roll confirmation - he was sent his Medal & 2 clasps in 1904. Walter Henry Holloway, a railway porter from Hamilton, attested for the 10th N.Z. Contingent and was embarked in the S.S. Drayton Castle in April 1902. In common with his brother, George, he was a member of ‘B’ Squadron, 1st Regiment, and saw brief service prior to the end of hostilities. Holloway died in Auckland in June 1954 and is buried in Purewa Cemetery; sold with copied research and roll confirmation. Peter McGregor Downes, a labourer from Beaconsfield, Otago, attested for the 10th N.Z. Contingent and was embarked in the S.S. Drayton Grange in April 1902. A member of ‘C’ Squadron, 1st Regiment, he saw brief service prior to the end of hostilities. Downes died at Temuka in August 1951, where he is buried in the local cemetery; sold with copied research and roll confirmation - he was sent his Medal in 1904 and his single dated clasp in the following year. William James Wilson, a bushman from Picton, attested for the 10th N.Z. Contingent and is believed to have been embarked in the S.S. Drayton Grange in April 1902. A member of ‘D’ Squadron, 1st Regiment, he saw brief service prior to the end of hostilities; sold with copied research and roll confirmation. William Hussey, a farmer from Upper Riccarton, Christchurch, attested for the 10th N.Z. Contingent and was embarked in the S.S. Norfolk in April 1902. A member of the 2nd Regiment’s staff, he saw brief service as an Assistant Regimental Quarter-Master Sergeant prior to the end of hostilities; he was sent his Medal & single dated clasp in 1904-05. In January 1915, Hussey attested for the New Zealand Expeditionary Force, aged 47 years, but was discharged one month later. He died at Christchurch in February 1935 and is buried in Sydenham Cemetery; sold with copied research and roll confirmation. 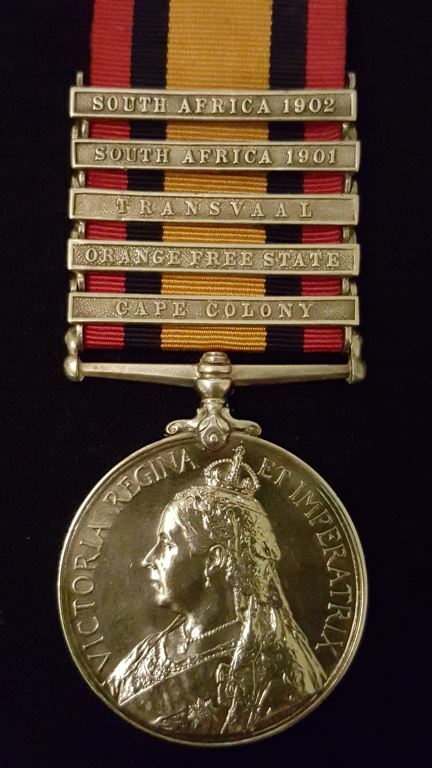 Note: The Cape Colony clasp has been added later, Trooper Thompson may have done further service in a militia unit Like so many colonial soldiers and thus believed he was entitled. Further research required. James William Quinn, a printer from Greymouth, Westland, New Zealand, attested for the 5th N.Z. Contingent and was embarked - as a reserve - in the S.S. Waimate in March 1900. He served in Rhodesia, and in other operations, and was invalided home at the year’s end, and received his Queen’s South Africa Medal at Wellington during the royal visit in June 1901. Quinn died in October 1937 and is buried at Anderson’s Bay cemetery; sold with copied research and roll confirmation. Michael Bertie Mason, a storeman from Ashburton, attested for the 10th N.Z. Contingent and was embarked in the S.S. Norfolk in April 1902. A member of ‘E’ Squadron, 2nd Regiment, he saw brief service prior to the end of hostilities; sold with brief research and roll confirmation. 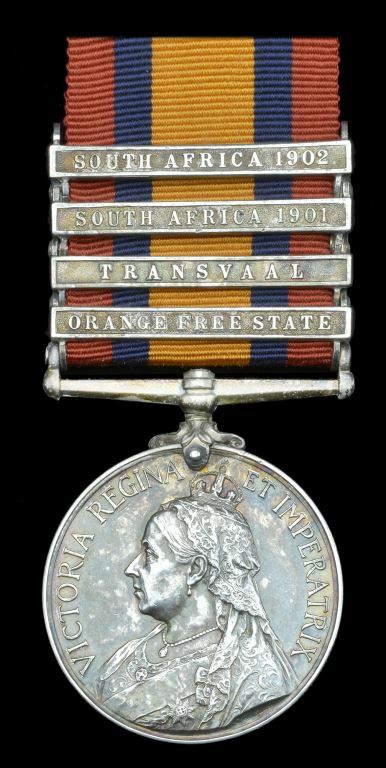 Single: Queen's South Africa 1899-1902, two clasps “OFS, T" impressed "628 TPR; H. HANCOCK SOUTH. AUS. I. B." Single: Queen's South Africa 1899-1902, five clasps "CC, OFS, T, 01, 02" impressed "25990 TPR. D. C. WHISKEN P. OF W. LT; HORSE"
NOTE: David Charles Whisken also served as Trooper 4041 3rd Imperial Bushmen (NSW) and this is confirmed on the medal roll. Single: Queen's South Africa 1899-1902, three clasps "CC, OFS, T" impressed "3*19 TPR; H B***I*** N. S. ****S I B"
Single: Queen's South Africa 1899-1902, five clasps "CC, OFS, T, SA01, SA02" impressed 2457 TPR J. McINTRE N. S. WALES M. R.
Single: Queen's South Africa 1899-1902, five clasps "CC, OFS, T, SA01, SA02" impressed 988 TPR. T. E. TOWNSEND N. S. WALES M. R.
Single: Queen's South Africa 1899-1902, two clasps "OFS, T" impressed 3240 Tpr. J. F. Neary, N.S. Wales M.R. Single: Queen's South Africa 1899-1902, four clasps "CC, OFS, 01, 02" impressed "299 TPR. A. M. LEE IMP; BUSHMEN"
Single: Queen's South Africa 1899-1902, two clasps "T, SA02" impressed 717 PTE. C. PARKER AUST. COM. 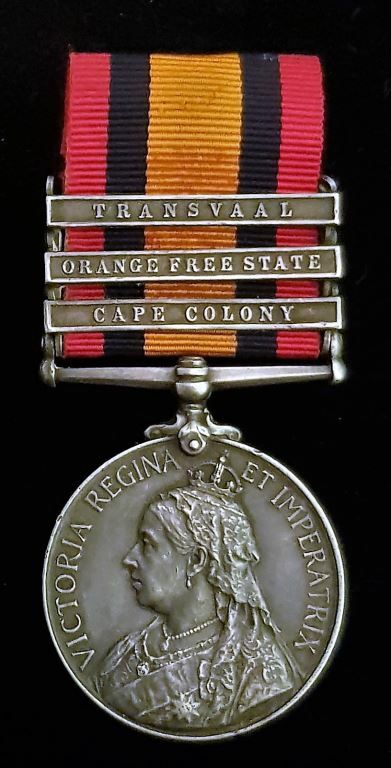 H.
Single: Queen's South Africa 1899-1902, five clasps "CC, OFS, T, SA01, SA02" impressed 3203 Tpr: R. Jackson, N.S.Wales I.B. Single: Queen's South Africa 1899-1902, four clasps "CC, OFS, T, SA01" impressed 145 Pte. E. Kelk, Queensland M.R. 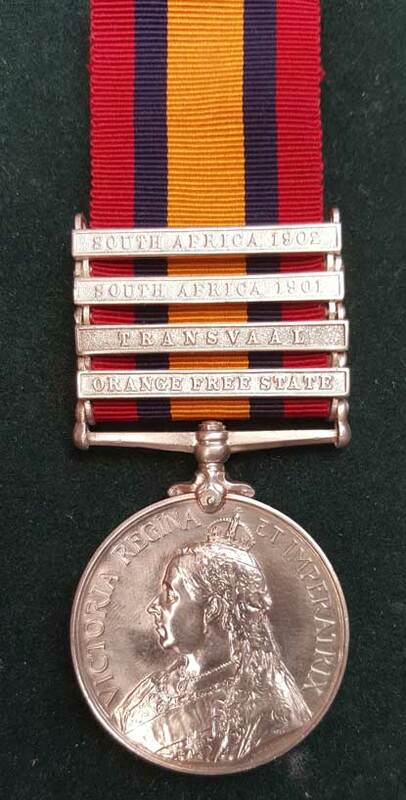 Single: Queen's South Africa 1899-1902, four clasps "OFS, T, SA01, SA02" impressed 49 Pte H. A. Elmhirst, Queensland I.B. 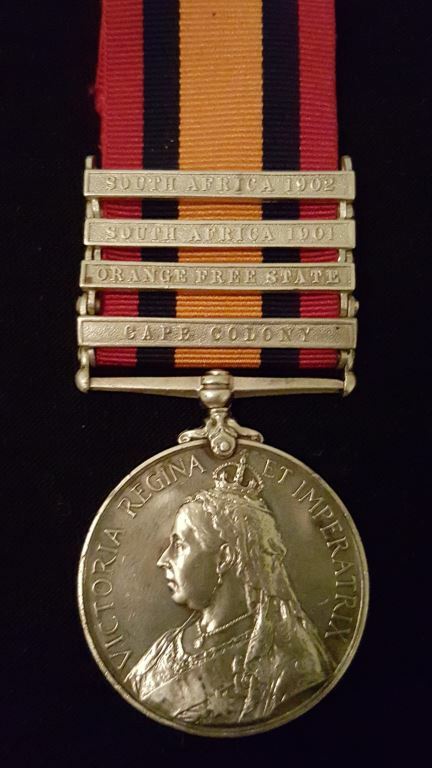 Single: Queen's South Africa 1899-1902, two clasps "T, SA02" impressed 2457 PTE R. ST. G. SIGLEY JOHANNESBURG M. R.
The following 19 New Zealand QSA’s are ex the lifetime collection of Barry Carr formed in the 20th Century and represent a selection which is becoming almost impossible to replicate in these modern times. Herbert Kerr, a labourer from Manakau, attested for the 4th N.Z. Contingent for service in South Africa and was embarked in the S.S. Gymeric in March 1900. A member of No. 7 Company, he served in Rhodesia, in addition to other operations, and was injured as a consequence of a fall from his horse at Zeerust on 24 October 1900. Having then been embarked for home in the S.S. Harlech Castle in the following year, he returned to South Africa, where he was resident in Pretoria in late 1906; sold with copied research and roll confirmation. Frederick Cutten Edwards, a shepherd from Wellington, New Zealand, attested for the 5th N.Z. Contingent and was embarked in the S.S. Waimate in March 1900. A member of No. 13 Company, he served in Rhodesia, in addition to other operations, and was discharged in October 1902. He died in Wellington in October 1933 and is buried in Bolten Street Cemetery; sold with copied research and roll confirmation - he was sent his ‘South Africa 1901’ clasp in 1908. Clement Lawrence Devereux, a clerk from Christchurch, attested as a relief for the 6th and 7th N.Z. Contingents and was finally embarked in the S.S. Cornwall in February 1902. Having seen brief service as a Private in the 9th Contingent in Cape Colony and Orange Free State, he was discharged in August 1902. He died in August 1917 and is buried in Linwood Cemetery; sold with copied research and roll confirmation. Arthur Mold, a farmer from Te Mata, Raglan, attested for the 7th N.Z. Contingent and was embarked in the S.S. Gulf of Taranto in April 1901. A member of No. 21 Company, he served variously in Cape Colony, Orange Free State and the Transvaal and was discharged in September 1902. He died in June 1961 and is buried at All Saints, Howick; sold with copied research and roll confirmation - he was sent his dated clasps in 1906. Alexander Mitchell, a ploughman from Pleasant Point, Timaru, attested for the 7th N.Z. Contingent and was embarked in the S.S. Gulf of Taranto in April 1901. A member of No. 24 Company, he served variously in Orange Free State and the Transvaal and fell ‘dangerously ill’ with enteric fever at Vreiheid in October 1901. Happily after being treated at Mooi River Hospital for two months, he recovered, and he was discharged in September 1902. Mitchell died in November 1955 and is buried in Eastern Invercargill Cemetery; sold with copied research and roll confirmation - his dated clasps were sent to him in 1907. William John Barker, who was born in Wanganui in May 1871, attested for the 8th Contingent and was embarked in the S.S. Surrey in February 1902. He subsequently served variously in Cape Colony and the Transvaal, and sustained a serious rupture after falling from his horse at Vaal Bank in May 1902. As a consequence he was recommended for a small pension for life - a recommendation turned down by the Pensions Board, Wellington, even though Barker was still in need of treatment when finally invalided in February 1903. He subsequently found work as a horse breaker, from which employment he enlisted in January 1915. Appointed a Trooper in the Mounted Infantry, he served in the Samoan Relief Force in March-June 1915 but was discharged in the latter month. 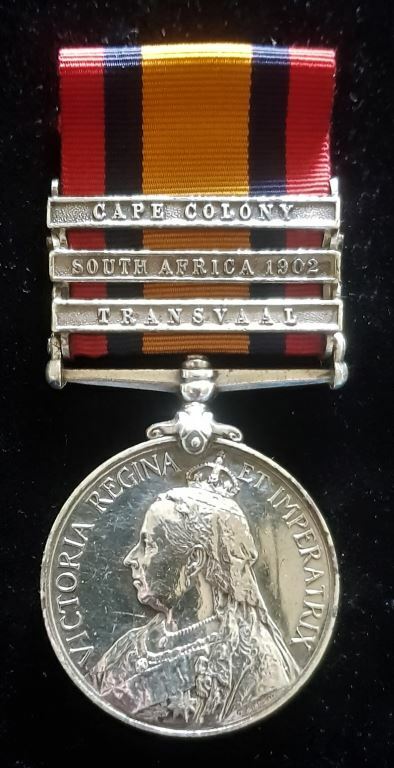 As a consequence, his sole medal entitlement was the British War Medal 1914-20; sold with copied research and roll confirmation - he was sent his ‘Cape Colony’ clasp in 1907. Frederick Charles Thiele, a letter carrier for the Chief Post Office in Christchurch, attested for the 8th N.Z. Contingent and was embarked in the S.S. Cornwall in February 1902. 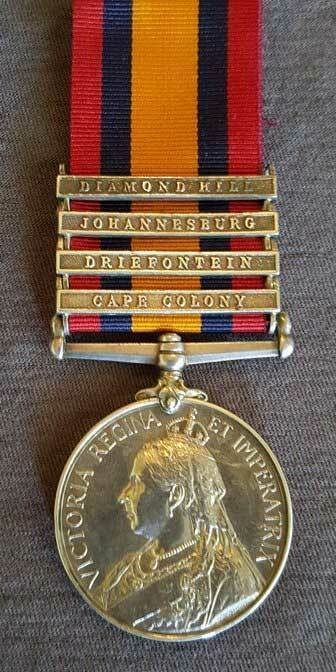 A member of ‘F’ Squadron, he served variously in Cape Colony, Orange Free State and the Transvaal. Thiele died in May 1954 and is buried in Linwood Cemetery; sold with copied research and roll confirmation - he was sent his Medal & clasp in 1904. 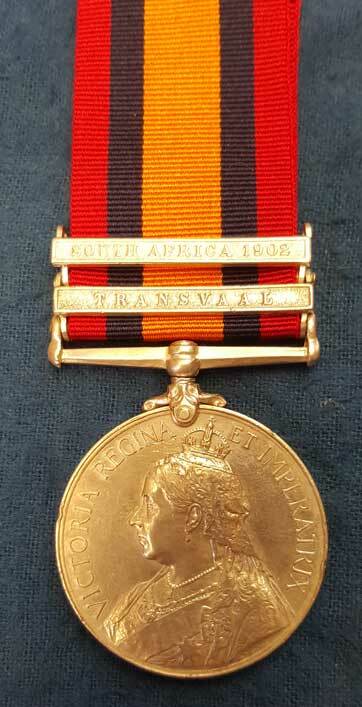 Single: QUEENS SOUTH AFRICA MEDAL 1899 three clasps "CC, OFS, T" Impressed 1402 PTE. J. T. HEWITT. VICTORIAN M.R. Note: Medal roll states service with the Left Wing, 5th Victorian Mounted Rifles who was under the command of Major McKnight. Major William McKnight and his men were involved in what some refer to as the original betrayal of the British command against Australian soldiers with troopers James Steele, Arthur Richards and Herbert Parry being sentenced to death. This led to Major McKnight calling General Beatson to account for his 'gross insults'. A belated apology by the General was curtly refused by McKnight. It must be remembered that just prior to this the Regimental Surgeon Herbert Palmer and 18 NCOs or men were killed at Wilmansrust, with a further five officers and 36 NCOs or men also being wounded. This incident is an extremely important event involving Lord Kitchener, The prime minister and even the King and had a huge part in Australia eventually taking control of its own troops. In 1910 Trooper Hewitt appears to have moved to western Australia with the Daily News (Western Australian Newspaper) mentioning him as a new member of the South African Soldiers Association of WA (Wednesday 7th September 1910). Frederick Pratten Stephenson, a chemist from Dunedin, attested for the 9th N.Z. Contingent and was embarked in the S.S. Kent in March 1902. A member of the Battalion Staff, South Island Regiment, he served in the Transvaal as a Corporal Dispenser. Stephenson died in October 1942 and is buried in Northern Dunedin Cemetery; sold with copied research and roll confirmation - he was sent his Medal & 2 clasps in 1904. NOTE: 1446 (or 1445 depending interpretation) G. McMahon also appears on the 6th medal roll as 1445 W. G. McMahon and is entitled to a 1901 clasp (copy of record provided). Further research is required. Single: Queen's South Africa 1899-1902, three clasps "CC, OFS, T" impressed 992 Pte. H. J. Hulme, Victorian M.R.